(partial) Mechanistic and continuum aspects of toughness in heterogeneous polymers, A S Argon. Unique contributions to understanding fatigue fracture from studies of cyclic deformation, C Laird & F L Liang. A new concept and energetical model of fracture using acoustic emission, L I Maslov. The behaviour of short fatigue cracks and their initiation, K J Miller. Study of the process zone at the crack tip (behavior of the voids at the crack tip of aluminum alloy specimen), H Miyamoto. Predicting the growth of small and large cracks using a crack-closure model, J C Newman et al. Mechanisms and controlling factors in creep fracture, W D Nix. Fatigue analysis for variable amplitude loading: fundamental aspects and engineering applications, H Nowack & R Marissen. Global and local approaches to creep crack initiation and growth, A Pineau. Crack tip shielding in fracture and fatigue: intrinsic vs. extrinsic toughening, R O Ritchie. Engineering problems and engineering solutions to stress corrosion cracking, M O Spiedel. Quantifying creep-corrosion interactions, D M R Taplin et al. Simplified design of composite materials, S W Tsai et al. Electrochemical reactions and corrosion fatigue crack growth, R P Wei. Elucidation of the mechanism of HIC and SCC with the aid of stress analyses and fracture mechanics, C M Hsiao. 2000 lit. refs., 1000 illus. Provides a thorough up-to-date account of the latest developments in materials science and engineering research and applications. 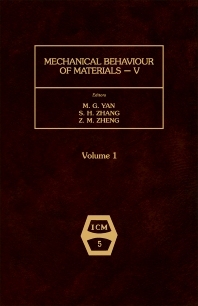 The contributed papers cover all aspects of this important field, including material aspects of fracture in engineering practice, fatigue criteria and material characterisation, environmental effects on fracture, high temperature deformation and failure and mechanical properties and engineering applications of composite and non-metallic materials. Contains approximately 200 papers from acknowledged experts. For materials scientists and technologists, mechanical and structural engineers.